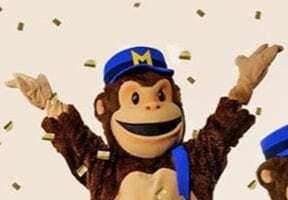 Here is a list of product releases and updates for mid-July from companies that offer services to online merchants. There are updates on shipping services, coding, ecommerce personalization, challenging Amazon, and buying and selling websites. Amazon launches third annual Prime Day. 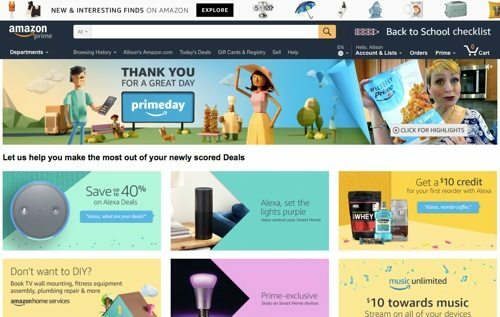 On July 11, Amazon launched its third annual Prime Day. Savings kicked off earlier for Prime members and were extended to last 30 hours. Sales for Prime Day grew by more than 60 percent from 2016. Prime members’ most popular purchase was the Echo Dot, the smaller version of the personal home assistant, which had its price reduced by $15, to $34.99. More than 3.5 million toys were purchased on Prime Day. Sur La Table and Instacart offer same-day delivery of premium household goods. Sur La Table, the premium kitchen goods retailer, and Instacart, the on-demand grocery delivery service, have launched a partnership to offer same-day delivery from over 90 Sur La Table locations. Shoppers can visit the Sur La Table grocery delivery site on the Instacart platform and have Sur La Table products delivered in as little as one hour. Parcelhub releases WooCommerce shipping integration. Parcelhub, a provider of ecommerce shipping and customer service solutions, has developed direct integration with the WooCommerce platform. Using the Parcelhub API, merchants can link their WooCommerce store to Parcelhub Web Despatch, allowing them to view any orders that have been paid for, and not yet fulfilled. Additionally, sellers will be able to map shipping methods in WooCommerce, to services within Parcelhub for additional timesaving and ease of use. The WooCommerce integration will also enable customers to set up specific rules for domestic and international shipments. Shopify launches Exchange, a marketplace to buy ecommerce websites. 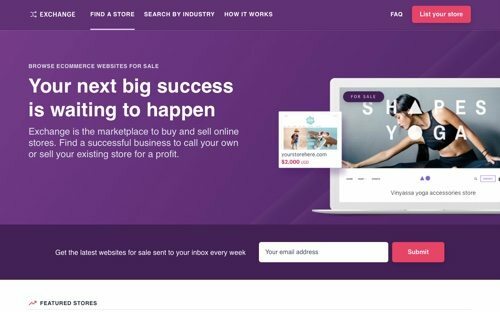 Shopify has launched Exchange, a marketplace to buy ecommerce websites — from established business for sale with high monthly revenue to starter stores you can buy for as low as $200. Revenue and traffic data come straight from Shopify and cannot be edited by the seller. For sellers, the Exchange app automatically creates screenshots of a store and suggests a selling price based on revenue and traffic. Regional grocers launch Unified Experience to defend against Amazon. In an effort to counter Amazon’s takeover of Whole Foods, Unata, a digital solutions company for grocers, has announced four retailers —including Lunds & Byerlys (in Minnesota) and Roche Bros. Supermarkets (in Massachusetts) — will soon launch Unata’s new “Unified Experience.” The platform connects three types of shopping: store list planning, delivery, and click and collect. Shoppers can also change modes at any point and have the experience automatically adapt, notifying the shopper of any product discrepancies that result from the mode change. TVPage joins Shopify Plus Technology Partner Program to deliver video commerce experiences to merchants. TVPage, a content management system that empowers video experiences to merchants, has joined the Shopify Plus Technology Partner Program to deliver shoppable video commerce experiences to Shopify Plus merchants. The TVPage Video Commerce Cloud enables Shopify Plus merchants to source, publish, and monetize shoppable video commerce at scale. Shopify Plus merchants can leverage the Video Commerce Cloud to deploy video experiences at every stage of the purchase funnel. Bazaarvoice announces Brand Edge to help brands accelerate retail channel sales. Bazaarvoice, a provider of consumer-generated content, advertising, and personalization solutions, has announced Bazaarvoice Brand Edge to enable brand marketers to collect consumer-generated content and distribute it to retail ecommerce sites in the Bazaarvoice network. The new solution puts influential ratings and reviews in front of shoppers in the retail channel and helps brands boost consideration and sales, successfully launch new products, and hear customer feedback. 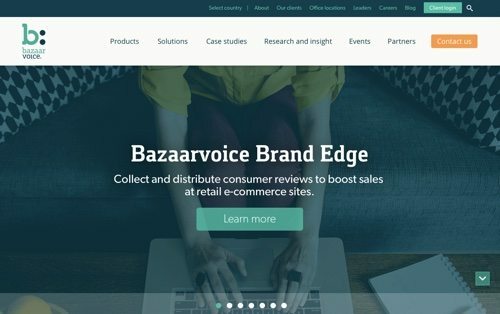 Brand Edge is Bazaarvoice’s first ratings-and-reviews solution that does not require ecommerce implementation, enabling brand marketers to easily collect consumer reviews and automatically distribute them to retail ecommerce sites. Coding Dojo announces Alexa coding boot camps. Coding Dojo, a host of coding boot camps, has announced it will host at least 30 Amazon Alexa skills workshops by the end of 2017 based on curriculum created in collaboration with Amazon. During the workshops, Coding Dojo plans to train at least 1,500 developers to create thousands of new Alexa skills, significantly expanding the current collection of 13,000 skills that enable people to intuitively interact with Amazon Echo and other devices with Alexa, using voice. Qubit joins Shopify Plus Technology Partner Program to provide ecommerce businesses with scalable personalization platform. Qubit, a provider of marketing personalization technology, has joined the Shopify Plus Technology Partner Program to provide companies with the opportunity to leverage personalization and ecommerce technology and build scalable online offerings. Qubit provides customer understanding, flexible segmentation capabilities backed with machine learning, and high-impact digital experience techniques. Catalina launches “Segment-Targeted Load to Card” with digital coupon offers at scale. Catalina, a personalized digital media company, is introducing a purchase-based digital coupon solution called “Segment-Targeted Load to Card” — SL2C. Catalina leverages scaled shopper insights to deliver targeted offers to shoppers based on their past purchases. SL2C improves the impact and value of a campaign by engaging the right consumers with the right offers to increase response rates and avoid subsidization. Marketers can choose to target just their own brand buyers with tiered offerings and purchase requirements based on historic buying behavior or all shoppers in a category, including those who have never purchased. 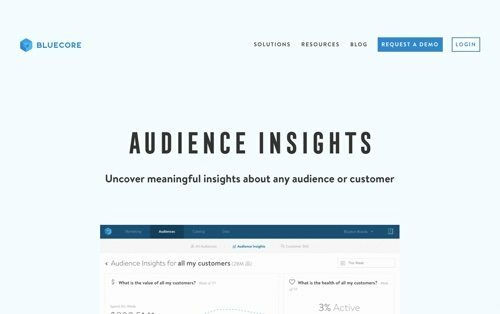 Bluecore launches Audience Insights for ecommerce marketers. 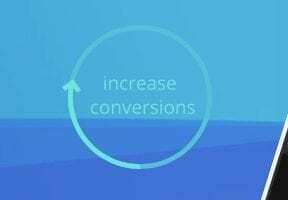 Once marketers create an audience within Bluecore, they can access Audience Insights to visualize how a particular segment is predicted to engage and convert, and then develop campaigns and strategies to maximize results. With Audience Insights, marketers can learn how their most valuable customer segments are performing relative to other customer groups, and how their campaigns fare with those audiences. Marketers can analyze this data week over week and plan marketing strategies against specific segments of their customer base.